Photographing baseball pitchers is perhaps one of the least predictable aspects of my job, for the men that play that position have the largest gamut of personalities. I have had the good fortunate to photograph many pitchers (Justin Verlander, Cliff Lee, Josh Beckett and Felix Hernandez), and not one was alike. Being the player that the rest of the game revolves around, the opportunity for ego is great, leaving it impossible to plan how the photoshoot will go. 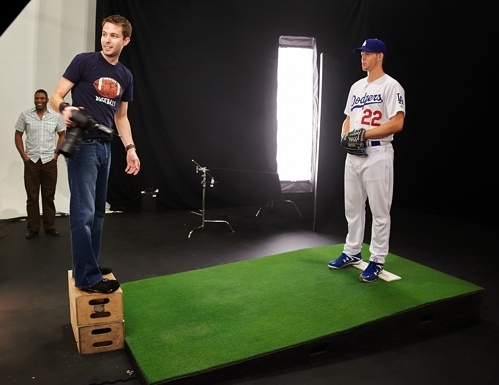 Enter Clayton Kershaw of the Dodgers…..
Background research showed me that he was an easy going guy that ego had not corrupted and fame had yet to reach. However, there was a large variable at play that loomed over my planning for the shoot. Clayton, is what you would call, “insanely talented”, and by insanely I mean the guy is on the verge of being the first pitcher to be paid $30,000,000 A YEAR in a contract worth upwards of $200,000,000…. or as the rest of the world knows it, Monopoly money. That’s the kind of money that can change a person, as it is not just a number that goes into a bank account, but rather a target as well. In a world of ruthless ambition to be rich, the limit to what people won’t do to have money is getting lower. I have seen agents that did nothing but raise hell on set just to get a small cut of the athlete’s paycheck. When I heard that Clayton, his agents, and even his wife would be attending the photoshoot I knew that inherent risk was the core of the shoot dynamics. 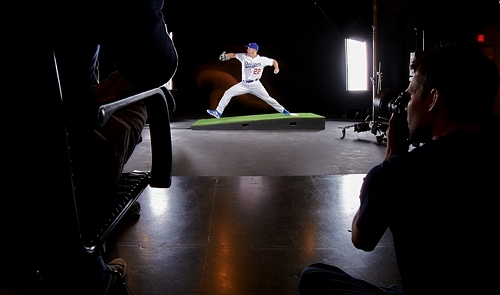 You can imagine the relief that fell over me when Kersh walked in the studio and thought it was cool that the grand set was for him to be photographed. He and his wife joked around the entire time he was in make-up and it was ever apparent that everyone on my crew and his were playing as one team. With the lighting dialed, the jersey cleaned and steamed, there was nothing holding us back from creating a killer ad………. except one thing. You see, with this campaign, the uniforms for the athletes were to be provided by the client and the smaller, more specific items like shoes and gloves were to be brought be the athlete. However, when Clayton walked on to his mark it became ever apparent something was forgotten as my bajillion dollar pitcher had no glove. Where a situation like this would normally panic a set, we actually chose to laugh about it, as there was no need to create chaos for the sake of chaos. We huddled around the couches in the back of the studio and decided to check and see if a nearby sporting goods store had a glove that we could purchase. 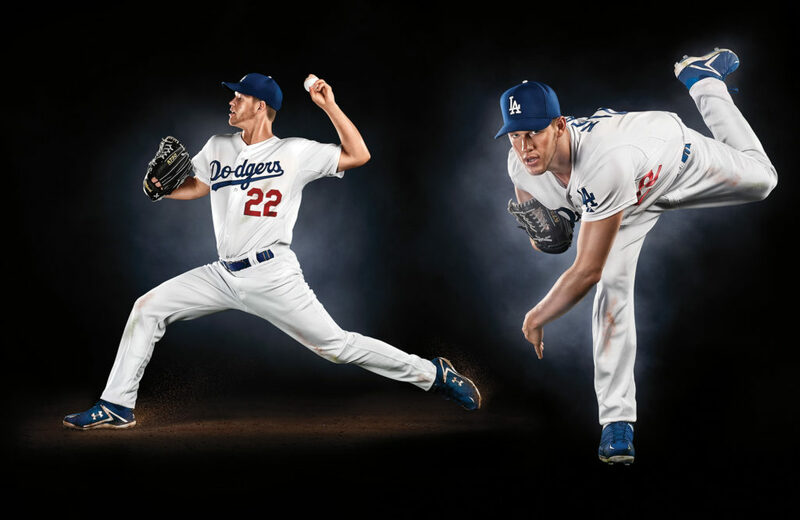 However, it had to be a very specific glove as Clayton is sponsored and a lefty, the two hardest attributes to shop for. I asked an assistant to grab a piece of paper and go have Clayton write down the exact glove that was needed with hopes that we could find it. Then the fun began… My assistant returns to me a couple minutes later looking confused and tells me Clayton and his wife took off to go buy the glove at a store…. Yes, one of the biggest pitchers in the league, in his uniform, was going to walk into a sports store and ask if he could buy his glove. Even if I could change anything, the only thing I would have done would have been to send a camera with them so I could see the look on the faces of the employees at the store. Returning to the studio, the group was successful and we proceeded to shoot what was one of the easiest shots I have done in a long time, a large part due to the effort of everyone in the building. From Mekanism crew, my crew, to Clayton, his wife, and his crew, only one team existed. For this I am grateful and a big thanks to all that made it possible. As always, some behind the scenes shots from set (credit to Dan).